Portsmouth senior Danny Lattimore attempts to inbound the ball in the Trojans home loss to Gallia Academy on Tuesday. PORTSMOUTH – It’s tough to win a game when you’re not playing your best basketball on a given night. It’s especially tough to win a conference game against a team like Gallia Academy when you’re not playing your best basketball on a given night. That’s what the Portsmouth Trojans found out on Tuesday night in a home loss to the Blue Devils of Gallia Academy 62-44. It’s true, the Trojans fell behind early to a veteran Gallia Academy team 14-5 in the early stages of Tuesday’s game. However, they were able to make up some ground and cut their deficit to just two at 14-12 when senior Myquel McKinley entered the game and provided some spark on the defensive end for the Trojans. Going into the half, Portsmouth trailed the Blue Devils 31-23, somewhat eerily similar to their home game against South Point earlier in the season when the Trojans trailed the Pointers 29-20 before making a big comeback and winning 48-44. 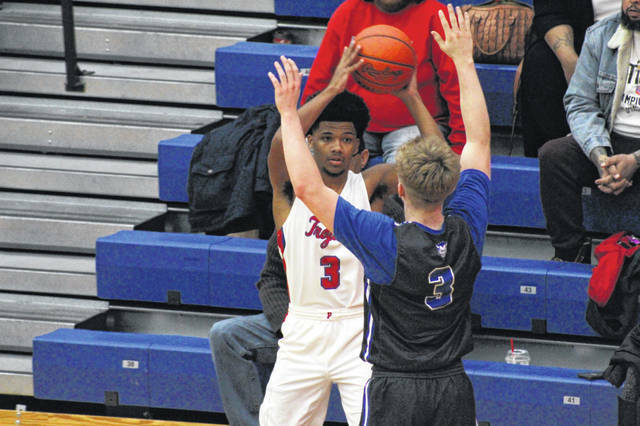 However, unlike their game against South Point, Portsmouth was unable to limit Gallia Academy’s offensive production, resulting in a 62-44 loss on their home court. Junior Matthew Fraulini, who on Friday against Rock Hill broke the school’s single game scoring record with 46 points, entered the fourth with just four points before ultimately finishing tied for a team high nine points with fellow teammates McKinley and Miles Shipp. Collins knew that Fraulini would face a much bigger challenge when trying to score the ball on Tuesday rather than he did on Friday when he scored his career high. Portsmouth’s schedule doesn’t get any easier moving forward. The Trojans will host OVC rival Ironton who fell to Coal Grove in triple overtime Tuesday on Friday, as well as a road trip to South Webster on Saturday to face the Jeeps.